There’s kind of a running joke in my house. Any guest who uses the bathroom will probably notice a few empty toilet paper tubes sitting in a basket on the floor next to the garbage can. That’s because my family knows not to actually put them IN to the garbage can. They are being saved. 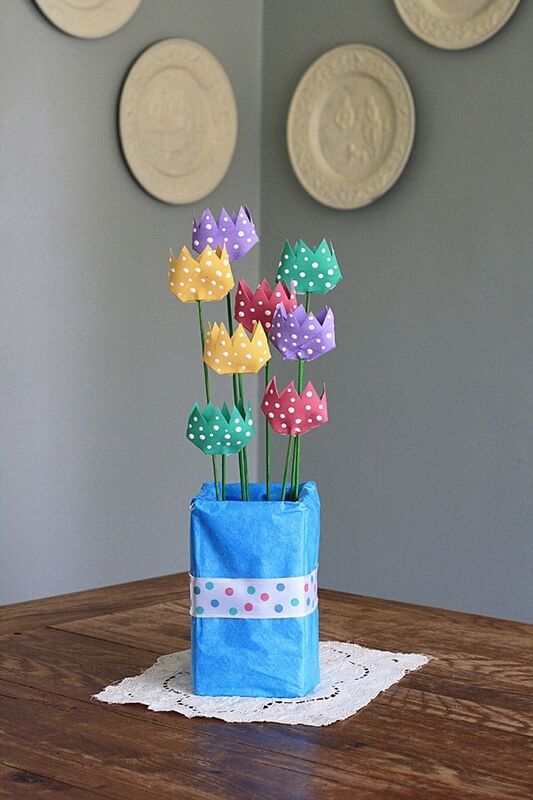 For cute projects like these polka dot tulips I made for Spoonful. I was going to add leaves to them, but once I figured out which container I was going to use to display them, I realized they looked better without. The container was so simple. It is one of those plastic holders for Beanie Babies (remember those?) wrapped with folded tissue paper. I tacked it shut with a glue stick and wrapped a piece of ribbon around the middle. Easy peasy. In the tutorial (link below) I only mention generic paint colors. 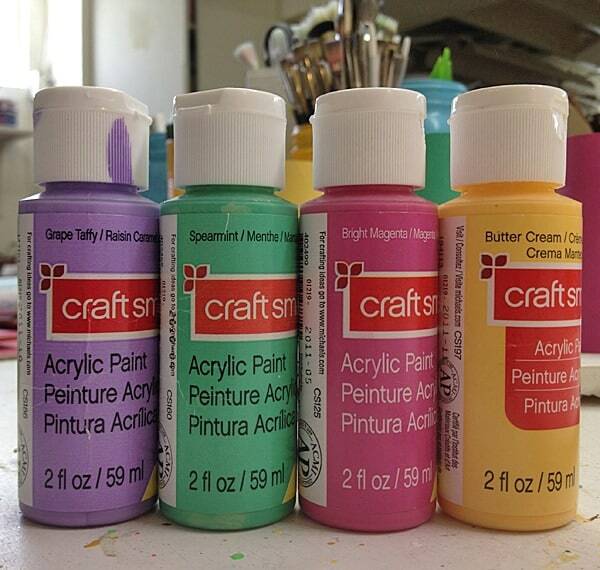 If you’re wondering what type of paint I use for most of my kid’s crafts, it’s usually Craft Smart. It’s really inexpensive but the quality is good. You can find it at Michaels only. The colors I used were Grape Taffy, Spearmint, Bright Magenta and Butter Cream. Each 4-inch cardboard tube yields two flowers. 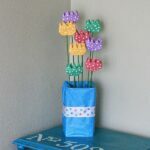 They are easy to make, but a glue gun is needed, so keep that in mind when working with your kids. In case you’re wondering, I drew some inspiration from an image I found on Pinterest. Unfortunately, I was unable to find the original source. It seems to have started on some pinning type boards and forums in a country outside the U.S. They are lovely! Paint each cardboard tube, inside and out and allow to dry for about 20 minutes. Tubes should be dry to the touch, but the cardboard should still feel damp and pliable. While the cardboard tubes are drying, paint each dowel green. Using a block of floral foam or Styrofoam makes a great stand! Cut each cardboard tube in half (2-inches long each). Each tube will yield two flowers. You should have a total of eight painted tubes. Flatten one end of the tube, then cut a 1/2" slit at both creases. At the cut, fold the corner of the cardboard tube inward. Add a dab of hot glue in the corners to hold them together, but do not glue the center yet as the dowel will be inserted here. 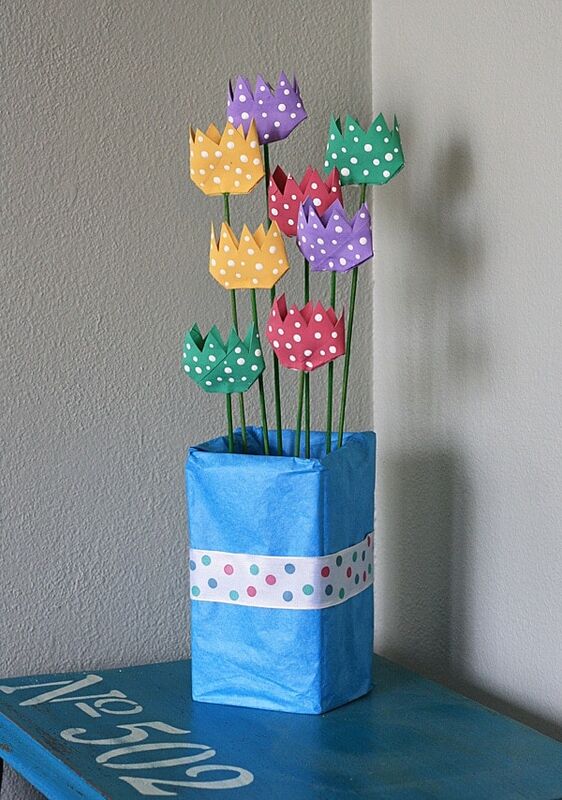 At the open end of the cardboard tube, cut triangles to form the tulip petals. Add some hot glue to the center of the bottom of the tube and insert the dowel. Pinch the tube around the dowel to adhere the glue. Use the handle end of a paintbrush dipped in white paint to add polka dots to both sides of your flower. To display, add some floral foam to a vase or tall container. Insert the dowels into the floral foam. 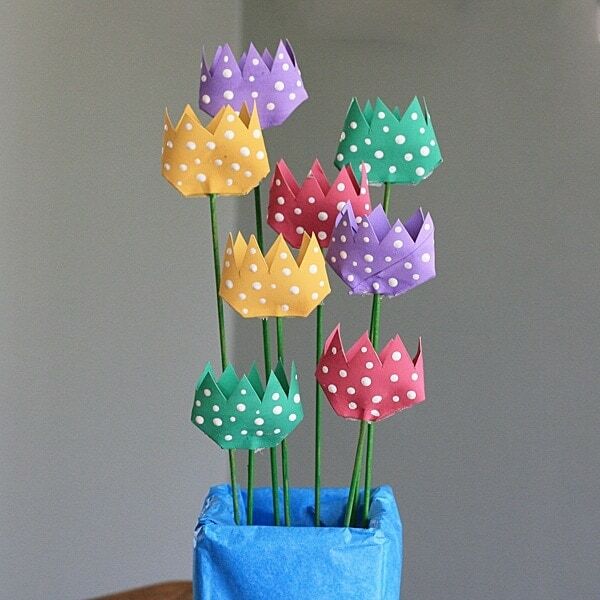 To open the flowers a bit, simply reach inside the top of each flower and stretch the cardboard outward. Once the cardboard dries for several hours, the tulips will hold their shape as the dried paint makes them stiff and sturdy. I originally made this project for Spoonful. Spoonful has since closed and the instructions were taken down. I am putting the instructions here until such time that Spoonful projects are redirected to a new home. At that time I will remove the instructions and link directly to the project on their site. Hi Amanda. 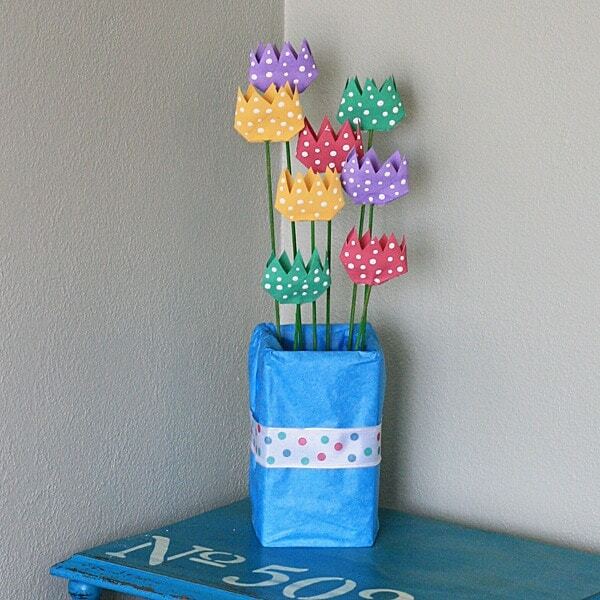 I would love to make the “cardboard tube tulips” but when I click on the link it goes to a Family Disney site ….can you help me ? Hi Sally. I’m afraid that the project is down temporarily until Disney moves everything to one of their other properties. I’m sorry! 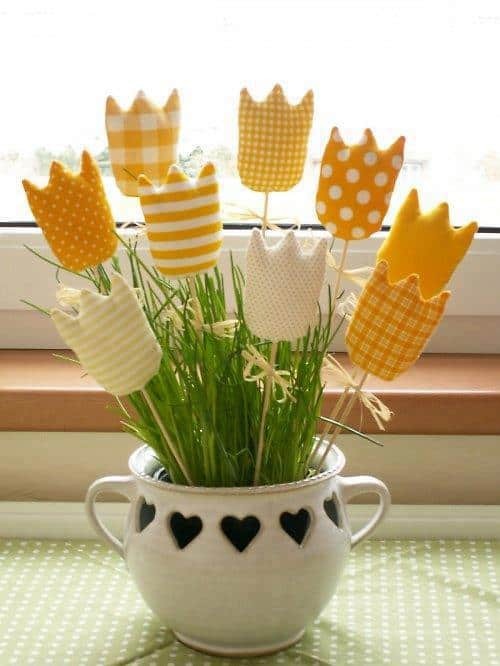 very lovely, like this kind of tulips. I love the tulips, however I do have a phobia about using toilet paper tubes. Considering what is normally done with toilet paper, I consider the tubes to be unsanitary. That’s why I’d rather use paper towel tubes.